When you think in an abstract way businesses can appear very complex, after all, all businesses above a certain size contain multiple departments with often competing activities, internal processes, multiple partners, suppliers, and customers etc. Note that this article has been replaced by a newer Business Model Canvas article, which goes step by step how to create your first Business Model Canvas. It also walks through three examples canvases for real companies to bring the theory to life. If we try and think about all of this at once it can become very confusing and especially difficult to understand the core of what a particular business is about. This is where a Business Model Canvas can come in very handy. It shows you on a single page the big picture of how a business operates. Because it shows everything on a single page it makes it easy understand the business model, and easy to share and communicate the business model. Below you will find a very quick introduction to the Business Model Canvas, giving you enough knowledge to make you productive with it, but should you wish to get under the skin of the Business Model Canvas then I recommend that you read the first 119 pages of the book, Business Model Generation. Every business needs to serve one or more customer segments. Businesses can define their own customer segments, but standard ones include mass market, niche customer segments, and customer problem based customer segments. This defines what customer problem is being solved and what need is being filled. Typical characteristics to base a value proposition on include performance, cost savings, reduction of risk, and price. Channels are the routes by which a business’ products and services are delivered to market. Channels fall into two broad categories. Direct, such as engaging a sales force or selling direct to the consumer through the Internet, and Indirect, such as being a wholesaler or selling through affiliates. A relationship is established with each customer segment that a business serves. Examples of customer relationships include personal assistance, communities, and self-service. Products and services (value proposition) which are successfully sold to customers will result in revenue streams. There are many different types of revenue stream including subscription fees, licensing, renting, and brokerage fees. These are the key assets and organization needs in order to deliver the value proposition. They could be physical resources or human resources, for example. 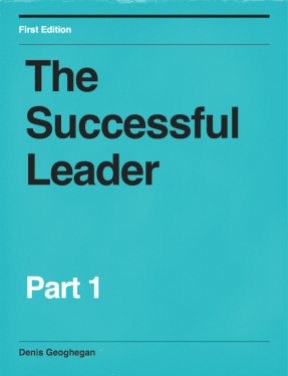 An organizations key resources will perform a number of key activities. This could be anything from factories producing goods through to problem solving. Are any key partnerships in place to make the business model work? It is for example a common occurrence to outsource the non-core activities of an organization. It is also common to offshore and outsource manufacturing to save money. Running an organization results in costs, and we refer to these as the cost structure. If the description of the building blocks has left you very confused, then the canvas makes a lot more sense when you see one. 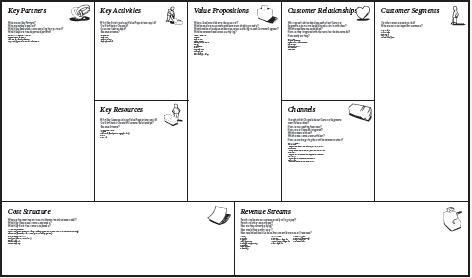 I’ve copied and uploaded a Business Model Canvas Template so you can use it to model existing business models or experiment with new ones. One thing to notice about the Business Model Canvas is that those elements to the left of the value proposition essentially represent costs to the business, whereas those elements to the right of the value proposition generate revenue for the business.